If ever there was a group of hucksters and charlatans, they are often seen overseeing extremely large mega churches. Some are obviously hucksters, more along the lines of head ringmaster at a circuses, while others come across as more subdued, present more of an intelligent air, are fairly sophisticated, and extremely nuanced in fleecing their flock. It all really depends on how they gauge the “clientele” sitting in the particular pew. The result remains the same. The average person attending these churches appears to have no problem lending their financial support to these professional pulpit profiteers. This was the subject of a documentary we recently watched called, Black Church, Inc. 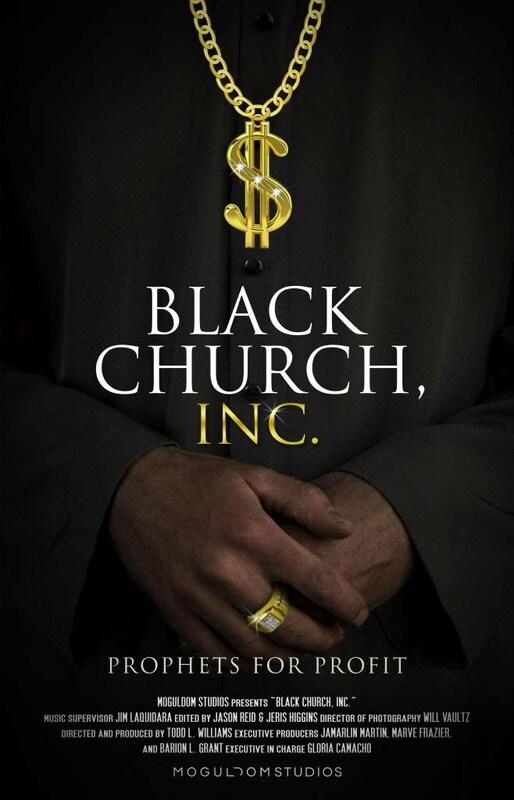 It focused mainly on large mega churches overseen by black pastors where most people attending are also black. People like Creflo Dollar, Bishop Eddie Long, Bishop T. D. Jakes, and others are included in the documentary and known to most. However, it can be easily stated that the same applies to Kenneth Copeland, Joel Osteen, and many other non-black pastors. Some of the individuals highlighted in the documentary are clearly unknown up-and-comers, hoping to one day grasp the lifestyle lived by Dollar, Long, Jakes, and the others. For now, they are literally pimping themselves for their own gain, to feed their own stomachs, under the guise of Christianity. These individuals are incorrigible and it would appear that their god is truly their stomachs (appetite for riches). It is very difficult to believe that they are authentic Christians, though that possibility exists. Clearly, they are blemishes and blots on the visible Church and unsaved people of the world certainly notice. These pastors live lavishly, often owning several “parsonages” worth well over a million dollars each. Several have their own jets with the excuse that the airlines don’t operate within their schedules. At one point, Sen. Grassley’s congressional committee took notice of the excesses and attempted to bring the hammer down since he was part of the committee that fed into and oversees the IRS. Ultimately, all he did was waste taxpayer’s money because he was unwilling to go to the mat. In spite of his failure to follow through, a good bit of information came out about the lifestyles of these professional showmen thanks to the media and the initial investigation by the congressional committee. One black religion reporter at CNN essentially said that mega churches will never change unless and until the people in the pews revolt against the lifestyles of these pastors. He also said a revolt was very unlikely due to three reasons. First, these black pastors will play the race card almost immediately when pressure begins mounting, claiming that the reason they are being pursued is because they are black. Second, if the race card doesn’t work, they will play the persecution card, stating that they are being persecuted for being Christian. Third, most of the black congregations are made up of black women who tend to see their black pastors as the husband they don’t have or the brother they want. Because of that, they feel a very real sense of protection toward them. So, when these black pastors are verbally attacked, the people of their congregations will rise to their defense. It doesn’t matter if there are pending lawsuits, charges of sexual misconduct, or something else entirely. To the people in the pews, their black pastor has attained something that has largely been reserved for whites and they are not about to let it go. What does all of this say about the people in the pews? It tells us that for the average person who attends a mega church (whether the pastor is white, black, male or female), the truth seems to be that too many simply do not think for themselves. They simply accept what is presented or taught to them every week as it aligns with how they feel about someone or something. As the CNN religion reporter noted, these leaders are essentially involved in gospel-tainment. The documentary took us inside these churches during worship and it really does all seem to be about entertainment. I’ve talked to black Christians who initially attended a black mega church, but left because they realized Sundays were all about entertainment and nothing more. It’s the way many “emergent churches” of today present Sunday services. In mega churches, it’s all too often about the business of pumping people up and making them feel good. If folks feel good, they will open their wallets without hesitation. These mega churches have budgets that are into the multiple millions of dollars annually, fleecing the people who attend with empty promises and lots of show. Not surprisingly, people attending these churches feel “blessed” because they give so much and they really aren’t concerned about how their financial gifts are spent. As one man said, “it’s between [the pastor] and God.” No, Christians have some responsibility to ensure that the money they give to the Lord’s work is actually used for that work. In another segment, actor, producer, and director Tyler Perry can be seen on the platform with one of these mega church black pastors, hopping around the stage speaking in “tongues.” He eventually turns to the pastor and prays over him while four guys hold the pastor up so he won’t fall over (slain in the Spirit). Perry donated one million dollars to that pastor’s church. That’s a drop in the bucket to Perry’s net worth of over $800 million. It’s all about the money, the notoriety, the fame, and the lifestyle. The people in the pews are taught that if they give, God will out give them. They never experience what those pastors have and never will. The pastors drive Bentleys or other very high-end expensive cars. Their homes are opulent and they have the best of everything. The average person in the pew will never attain any of that yet they continue to believe they are “blessed” simply from their association with that church and their giving. This could all be so easily avoided, but that would require people to read and know their Bibles, to understand that there is tremendous error in many of the mega churches across America and the world. If people’s eyes were opened and they left these churches for more biblical waters, the pastors of these mega churches would have no position, no lifestyle, and no self-gratification. It’s doubtful this will occur because of the thousands and thousands of people willingly and without any biblical discernment whatsoever, open their wallets and throw money at them. It would appear that these pastors have their reward now. It is also important to note that the majority of mega church pastors oversee churches where signs and wonders – to a small or large degree – are part of that church. Worship, if you can call it that, is often highly energized, with the best sound systems, the best musicians, singers, repetitive inane choruses, and yes, even dancers. These churches work very hard to create an environment where people’s emotional desires and felt needs are met. Ultimately, this softens them up, making them very pliable. When these folks leave, they believe that it was good to be in the house of the Lord. Unfortunately, the feelings they experience are a great deal like the after effects of seeing a high-energized concert or sell-out Broadway play. For them, it was money well spent. One congressional aide to Sen. Grassley said she did not believe the pastors they asked to provide financial disclosures were evil. She believed they have powerful attorneys who are very adept at getting around the letter of the IRS tax code, while remaining within the spirit of the code. She also said that she believed these pastors are very shrewd businessmen. No, those pastors are at the very least, deceiving their flock, which is exceedingly evil. Isn’t that what both Peter and Paul state in the above Scriptural references? These pastors have given themselves over to the very things from which Jesus said we should turn away. It is always interesting to note that Jesus Himself had no place to lay His head. In essence, He was “homeless,” and lived off the kindness of those who followed Him and appreciated His ministry. He ultimately depended upon God the Father for everything He ever received and He lived to please Him through obedience and fulfilling His will on a daily basis. However, he never had much, but He Himself said His “food” was to do the will of Him (the Father), who sent Him (John 4:34). Today, however, for too many, Christianity has become living the mega rich lifestyle. The documentary is interesting, though not eye-opening. We are all well aware of the abuses financially, sexually, and otherwise that these “men/women of God” have been involved in and in some cases, continue as though they’ve done nothing wrong. Won’t it be nice when the Lord returns? This kind of chicanery will evaporate like fog on a hot day. In truth, what is happening in too many mega churches is nothing less than what happens with celebrities in Hollywood. To the average American, these celebrities are like Roman or Greek gods. Yet, we’ve seen many of them crash and burn over the years because of the lack of protection from studios and due to the growth of social media. The same thing applies to these mega church pastors. Their parishioners treat them like little gods. Some of the pastors themselves act like gods when they aren’t acting like circus barkers. This is the state of a large segment within Christendom today. It’s all about the money. It’s all about running the con but making sure that a good deal of money is spent on entertaining the people every Sunday. They are getting a lot of bang for their buck so in that sense, these pastors believe the people are getting a return on their “investment.” But to what end? Entry filed under: Atheism and religion, christianity, Cultural Marxism, Demonic, devil worship, Emotional virtue, eternity, Life in America, Religious - Christian - End Times, Religious - Christian - Prophecy, Religious - Christian - Theology, salvation, Satanism, second coming. Tags: black church inc, black megachurches, cnn religion reporter, creflo dollar, eddie long, gospel-tainment, t d jakes, tyler perry. Well done expose of the growing multitude of hucksters on TV and radio exploiting the divinely inspired Words of God in the Bible for filthy lucre. Many of them may be fake Christians or CINOs who will reap the wrath of Jesus, not on earth like the temple merchants, but surely after death when standing before stern Judge Jesus. Yes, many may share the fate of the Rich Man in the true account, not an exemplary parable, in Luke 16;19-31 who has been suffering constantly and mercilessly in a literal hades for at least 2000 years with eternity to go……a high price to pay for a transient earthly life in prosperity! Thanks for your comments. Yep I fear that they have their reward now and will wake up in eternity following their deaths to a very rude awakening. The people in these “churches” are really just like members of cults: they don’t read the Bible for themselves and just accept everything from the pulpit as truth from God. And, just like cult members, they will defend their leadership no matter what is taught or no matter how the behave. They remain deceived by their investment in the cult/teacher because they are too proud to admit they have made a mistake in following such leaders. I couldn’t agree with you more, Glenn. Thanks for your comments.